All quoted prices include delivery throughout East Anglia including Norfolk, Suffolk, Cambridge and Essex. We aim to deliver within 10 working days from receipt of your confirmed sizes. We can of course deliver throughout the UK, for other area please check with us first. All of our shutters are made to measure, for more information please check our sizing guide. 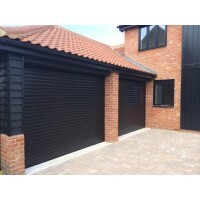 Remember if you have two garages that are joined together you may only need one external manual override.